St. Clair Streett was born in Washington, D.C., in 1893. After graduating from high school, he enlisted as a sergeant in the Signal Corps, Enlisted Reserve, on December 8, 1916 and was assigned to the Curtis School in Newport News, Virginia, as a flying cadet. He received training at Columbus, Ohio, and Wright Field, Ohio and was commissioned a first lieutenant in the Aviation Section of the Signal Officers' Reserve Corps September. 27, 1917. General Streett participated in the Alaskan flight made by the Air Service between July 15 and October 20, 1920, for which he was awarded the Distinguished Flying Cross. He then was appointed assistant to the assistant chief of the Air Service. In July 1922, he became commanding officer of the headquarters detachment at Bolling Field, D.C., and soon afterward became model airways officer at Bolling Field. of the First Pursuit Group Headquarters. He was assigned to Wright Field, Ohio in March 1928 as test pilot and chief of the Flying Branch. During July 1932, he was on special assignment as assistant in the preparation of data on performance tests of aircraft. General Streett spent the following three years at service schools. He entered the Command and General Staff School at Fort Leavenworth, Kansas, In August 1932. After graduation In June 1934, he began a course at the Chemical Warfare School at Edgewood Arsenal, Md., which he completed in August. He then was transferred to the Army War College, from which he graduated in June 1935. General Streett's next assignment was with the War Department General Staff where he served as a member of the Miscellaneous and Operations Section of the War Plans Division. He became a student at the Naval War College at Newport, Rhode Island, in June 1939, and in July 1940 reported to Hickam Field, Hawaii, for duty as commanding officer of the 11th Bombardment Group. In April 1941, he became plans and training officer for the Hawaiian Department at Fort Shafter, and then was attached to the Army Air Forces division of the War Department as deputy chief of operations. In March 1942, he became chief of the Theater Group of the Operations Division in the Office of the Chief of Staff. In November 1942, he was appointed commander of the Third Air Force at Tampa, Fla., and in September 1943, assumed command of the Second Air Force at Colorado Springs, Colorado. 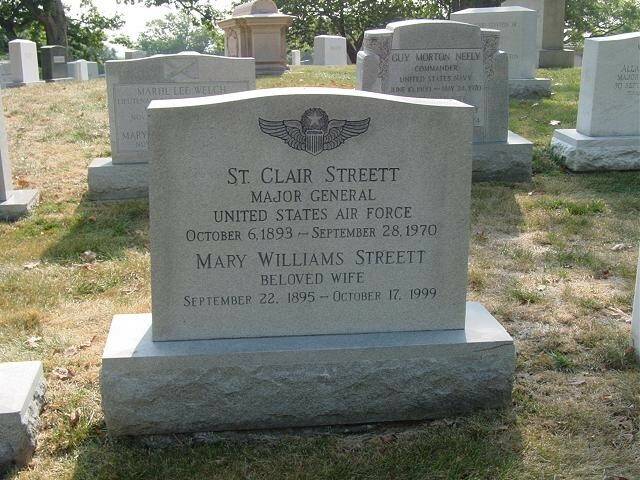 General Streett was buried with full military honors in Section 5 of Arlington National Cemetery.